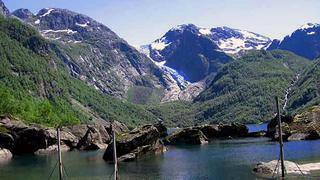 Norway has some of Europes most beautiful coastal scenery, such as the Bondhusbreen Glacier. Remote islands, distant reefs, stunning wildlife, ancient cultures: whatever floats your boat, its out there somewhere. Alaska : Take helicopter trips over glaciers, visit steaming hot springs, spot killer whales, go hiking, or fishing  you wont run out of amazing things to do. Baja Peninsula : The fantastic juxtaposition of desert and ocean means clear water for snorkelling. Swim with friendly seals or kayak through the mangrove forests. Patagonia : Explore Chiles fjords of the south. Specialist cruises on yachts such as Atmosphere can make your trip truly unforgettable. Andaman Islands : This unspoilt, safe and stunning outpost of India teems with marine life and boasts the beach voted the best in Asia. It also has amazing fishing, as commercial activity has been banned for over 50 years. Maldives : Beautiful, but there are few natural anchorages. The water is very deep or very shallow  great for catamarans. However, charter licences are expensive as tourism is focused on land-based resorts rather than yachts. Seychelles : The pirate threat hasnt stopped some big yachts heading here for the winter season. This is a unique destination made up of 100 islands, nearly half of which are protected to preserve unique wildlife, such as the giant Aldabran tortoise. Norway : Uniquely beautiful, this area is best viewed from the sea as you try to take in the scale of these immense glacier-carved valleys. Sweden : Cruise Stockholms archipelago to get away from it all, and then explore one of Europes most sophisticated capitals. Thailand : Offers year-round exploration of hundreds of islands, with fabulous cuisine and fun ashore. Explore Phuket and the myriad of islands in the Andaman Sea south towards Malaysia from November to March, and switch to Koh Samui and the islands of the Gulf the rest of the year. Malaysia : Whether you visit wild Borneo (split with Indonesia) or islands such as Tioman, Malaysia has a lot to offer. Explore Langkawis 100 islands, or Penangs rich and ancient culture. Singapore : Great superyacht facilities and shopping  plus a great starting point for the islands of Malaysia and Indonesia. Indonesia : A vast and diverse archipelago offering diving, surfing, culture and adventure. Whether you choose popular Bali, exotic Komodo (here be dragons!) or the surf meccas of Sumatra, there is an Indonesia to suit every taste. Burma (Myanmar) : The Mergui Archipelago is the best-kept secret of Asia. It only opened to foreigners in 1997, revealing its uninhabited islands of lush rainforests and dazzling reefs. Its worth the red tape to visit one of the least explored and most exclusive destinations on the planet, only accessible by yacht. New Zealand : From Aucklands sailors paradise to the cold waters of the South where youre escorted by pods of dolphins, New Zealand has it all. French Polynesia : For picture-perfect lagoons and haute cuisine, you cant beat these South Pacific Islands. Fiji : With the Blue Lagoon, underwater caves and lush hiking, Fiji is great for the adventurous. Alternatively, relax with a hot-stone cooked lovo meal.